Although Wednesday's iPod announcements were seen as a relative "non-event," analysts are still high on Apple stock, predicting that the hardware maker will continue to perform well in a down economy. Senior Research Analyst Gene Munster said that Wednesday's announcements were a "non-event," though he said the return of company co-founder Steve Jobs to the stage was a welcome event. As for the products themselves, Munster said the iPod touch price cuts were a "slight disappointment," as was the lack of a camera on the device. "We were expecting a new iPod touch model with a video camera, which Apple did not announce," he said. "The lack of a camera may be due to last-minute quality issues, or it may also be a strategic decision to differentiate the nano from the touch, and the touch from the iPhone. Ultimately we see the lack of a camera in the touch as a move to push users toward the iPhone and drive purchases of multiple devices per customer by segmenting the product lines." In addition, Apple announced Wednesday that it has sold over 30 million iPhones to date. Munster said that means that the September quarter is tracking the way he expected it would, as the numbers imply sales of over 3.6 million so far in the quarter. The analyst believes Apple will sell 7 million iPhones for the period. He has maintained an overweight rating for AAPL stock with a price target of $186. Analyst Robert Cihra continues to see the iPod touch as the "ace up Apple's sleeve." He predicts that the iPod will account for 23 percent of Apple's revenue in the 2009 fiscal year, and believes the iPod touch will grow to 10 percent of the company's total revenue. He said the iPod touch has a unique product angle that competitors can't offer, especially given the fact that Apple is promoting the device as a game player, in addition to a media player. Among the other lineup changes, including a camera-equipped iPod nano and a $59 iPod shuffle, Cihra said the iPod touch is still the standout product. He believes Apple will refresh its MacBook lineup in the December quarter, given that in June most of the lineup was moved to the unibody "Pro" category. That prediction corroborates with information relayed to AppleInsider that Apple will retain and redesign its low-end plastic MacBook family. Cihra predicts that the new MacBooks could have an entry price $100 lower than the $999 offering sold today. Caris & Company has reiterated its buy recommendation for AAPL stock, with a price target of $200. Analyst Charlie Wolf said that Steve Job's first public appearance since his liver transplant helps to maintain a strong buy rating for AAPL stock. He has maintained his price target of $200. Wolf, in the past, has been critical of the App Store layout for the iPhone and iPod touch. With Wednesday's new Genius recommendation feature in iPhone OS 3.1, some of the analyst's concerns have been addressed. "The most significant new feature, in our opinion, is 'Genius Recommendation for Apps,'" Wolf said. "Genius recommends new applications to users based on the ones they've already purchased. Discovery is a critical component in Apple's efforts to build its developer community and, in turn, the number of applications on the App Store." Wolf believes that the biggest risk for Apple going forward is macroeconomic, particularly in how PC sales in general fare in a slumping economy. 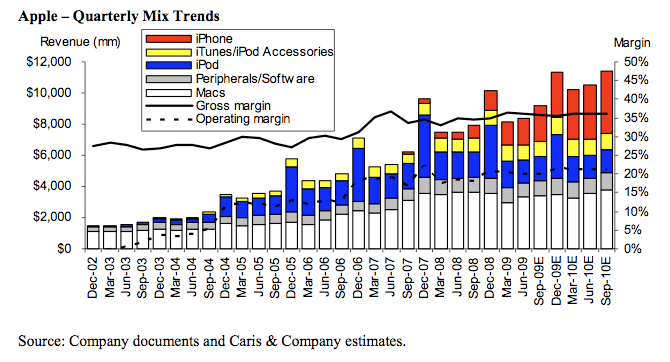 Apple showed there is still life in the iPod line, analyst Mike Abramsky said in his latest note to investors. He believes that the iPod touch and iPhone offer a significant upgrade opportunity for consumers —which is positive, because those products carry higher margins. "The touch at $199 should help sales momentum for consumers seeking apps and browsing on a portable device, but the absence of a camera (possibly owing to quality issues) remains a drawback vs. iPhone and nano," he said. Prior to this week's event, AppleInsider received word that technical issues with bad hardware could nix the inclusion of a camera in the iPod touch. Up until that point, mounting evidence had suggested that the camera was a foregone conclusion. Abramsky said that Jobs' announcement of 30 million iPhones in a little over two years could signal that Apple will fall short of fourth-quarter sales projections. However, he said the company tends to round off its figures at keynotes. Given that, he has maintained a prediction that the company will sell 7.2 million for the quarter. RBC Capital Markets has maintained its outperform rating for AAPL stock, based on four points: innovation across its entire line of products, higher margins than its peers, the growing iPhone market share, and what Abramsky calls Apple's VIP, or "Valuation Innovation Premium."